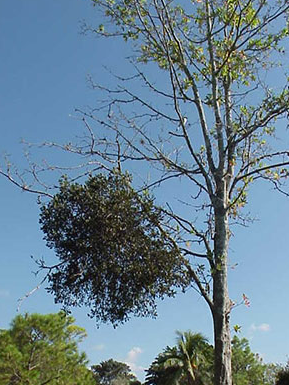 During my recent travels in Central Florida, I’ve noticed an over abundance of mistletoe growing in our trees, yet little if anything has or is being done to eradicate this pest. Why? If left unchecked, it can kill trees. Ancient legends considered mistletoe as a plant with supernatural powers for both good and evil. Pagans used it as a sacred emblem in their religious rites, while early Christians claimed that it was once a tree, but was dwarfed when its wood was used for Jesus’ cross. Today we use it as a Christmas decoration, which is supposed to shed blessings on those who stand beneath it. Say what you may, mistletoe is a serious threat to broadleaf trees and certain conifers, including junipers and some pine species. Mistletoe is a typically greenish parasite plant that grows on and within the stems and branches of trees and shrubs; and if left alone, can kill infected plants. It is also poisonous to humans and pets. A typical plant consists of a cluster of jointed stems with deep green leathery leaves. The stems are able to absorb water and nutrients from the bark and wood of the infected host plant. Flowers, which are borne at the base of the leaves, can be like holly – either male or female. These flowers produce translucent white berries in late fall – winter, which contain a single seed embedded in a sticky, viscous substance that easily attaches to bird parts – where they may be brushed off on a branch or limb and germinate. As a seed germinates, it produces a root-like structure that penetrates bark and attaches itself to the host plant’s phloem. Others may further develop into the cambium layer and become embedded in the wood. Once established, after 2-3 years, it will develop buds that form new shoots and more mistletoe. Because mistletoe is able to penetrate branch tissue, it can absorb water and nutrients from within the affected branches. Most trees can tolerate some mistletoe infestation, but individual branches affected by this parasite may be weakened and later die. Heavy infestations can reduce a tree’s vigor, stunt growth, and cause irregular swelling of branches, and can even cause its death. There are several options for managing mistletoe infestations, the most obvious is to plant healthy, mistletoe free trees. In some instances, licensed pesticide applicators have been able to apply Ethephon, a growth regulator, to the mistletoe prior to new growth. Unfortunately the results are only temporary and repeat applications are required. A third option is to remove any mistletoe infected branches as soon as the parasite appears either at the point of origin, or cut back the affected branch where it is connected to a lateral branch. The latter seems to work best as long as at least 2 feet of the affected branch is removed. Unfortunately either of these latter 2 options may be impractical because of tree size and location of the parasite. If left alone, mistletoe will most likely spread. A final option, which some have tried with various results, is to cover the infected portion(s) with a black plastic wrap to reduce the vigor of the parasite. However, it may take years for this method to be effective. In closing, I’d like to add that based upon my observations of mistletoe growing within our shade tree canopy, unless an aggressive area-wide integrated post management program is initiated, it’s only going to get worse for our trees. This entry was posted in Central Florida tree pests, Mistletoe, Plant Diseases, Plant Knowledge, Plant Pests, Trees and tagged Mistletoe, Tree pests. Bookmark the permalink.